Horse Riding Spain in the Gredos, a hidden gem, where you can ride back in time to a tasty and traditional region of Spain. The Gredos rides are located between the historic towns of Avila, Segovia, Salamanca and Toledo, just west of Madrid, taking you through the Castile region of Spain. Enjoy charming accommodations, gourmet food and wines, hospitality and attention to the detail for a truly memorable equestrian vacation in Spain. The terrain is excellent and varied for horse riding holidays in Spain, with mostly open fields, magnificent views, and ancient paths that follow the course of the rivers. The small medieval villages along these trails have had their architecture shaped by their unique surroundings. You'll experience splendid panoramic views and idyllic valleys where cattle and horses graze amid pristine mountain streams and rivers. The remote medieval villages you'll discover on horseback display the architecture, the history, the traditions and the way of life of the people isolated in this rural area of Spain. The Sierra de Gredos Mountain Range, situated southwest of Madrid has Regional Park Status. Trails in the Gredos take you through a typical, rural area of Avila. Originally, only shepherds moving their flocks had reached the remote alpine valleys of this mountain range. It wasn't until 1905 that the Sierra de Gredos became an area of interest when King Alfonso XIII created the Gredos hunting reserve in an attempt to protect the wild Spanish Ibex, of which only a few were left. Today the Gredos Mountains have one of the largest remaining populations of this goat and it is thanks to Alfonso XII that there are now byways in place to reach the highest peaks of the Gredos, its glaciers and its lagoon (Laguna Grande). Roman roads can also be seen here, as although they did not settle in the Gredos, they created mountain passes for the movement of troops. The medieval town of Avila is surrounded by walls constructed in the 11th and 12th centuries. It was and still is a very religious place, with a grand gothic cathedral, charming squares and beautiful, quiet streets, which are very pleasant for walking around the historic city. As riders explore this fascinating part of Spain, they will be impressed by the diverse display of flora and fauna through the Tormes, Corneja, Alberche and Tietar river valleys. The landscapes here are full of light and color, where wild nature shows its splendor. There are opportunities to ride up slopes of oak, pine and chestnut trees, cross rivers of pristine waters, discover wildlife from rocky overlooks and gallop across pastures and open fields. This is an inn-to-inn equestrian vacation. Every evening riders will arrive to a different charming area on horseback, right to the entrance of the hotel. At every place, your guides have organized nice fields for the horses to spend the night. You may enjoy a view of the horses from your room’s window. In one of the hotels, horses actually come to the window and wake you up in the morning! This outfitter is a member of the permanent forum of the Gredos Nature Park. They are involved in the conservation project and in the development of responsible and sustainable tourism. The Gredos Park has applied to be a member of the Europarc Federation and is working within the European Charter for sustainable tourism in protected areas. s, products, hotels and more. You'll stay at the National Parador, which is state owned and employs at lest 50 people from the village (which is their policy). All the other hotels are run directly by locals. Most of the picnics are prepared by the local bars of the villages we ride through. Support vehicle are regularly checked for emissions, but the rides do not requires transport of the guests, as you ride to the hotels where you and the horses stay, and the vehicle only does the strictly necessary mileage to support the ride. Waste is minimized on rides. Picnics are had using crockery, cutlery, and glasses. Maria Elena does not use plastic and recycles all that can be recycled. She believes that these small measures do add up, and it means you can feel like a responsible traveler on her horseback riding vacations. This is a very unspoiled part of the world and hopefully it will remain like that for future horse riding Spain adventures. The principle of “layers” is always very convenient, any time of the year. • Riding helmet (a few helmets are available at the riding centre). Not mandatory but advisable. Excellent well-bred Hispano-Arab, Andalusian, Lusitano and Arab horses, about 15-16hh. Very well trained, sure-footed, good-natured, well behaved, fit and fun to ride. They are all loved and you will feel it when you ride and when you are with them. The outfitter takes great pride in their ability to match horse and rider. All of the horses have a basic training in dressage and will fulfill experienced riders' expectations. Horses are responsive to the English way of riding, but they are very responsive to weight and the seat and you can neck rein as well, always with a light contact with their mouths. The horses (21 horses in 2010) are the "professionals" of the long week rides. The outfitter only dedicates their horses to trekking, as these horses like this kind of work and being out in nature. They have the best life horses can have and enjoy long periods in beautiful mountain pastures and open fields. The outfitter firmly believes that the horses enjoy the rides and the nice fields in all the different places where you'll stay. The fact that pretty competent riders ride them, keeps them lively and sensitive. The towns of Madrid, Avila, Segovia, Salamanca and Toledo can be visited before or after the ride. They are all within a 2 hour drive from where this riding holiday takes place. A short visit of Avila is included in The Valleys of Gredos ride. A day in Avila is included in the Sierra de Gredos Summer ride. Julie, who books these riding vacations, can help with bookings and recommendations extra days before or after the ride. Avila is a medieval walled town that is one of the World Heritage Cities of Spain, one of the 660 cultural sites in the world that the World Heritage Committee considers as having outstanding universal value. Avila is the “City of Saints and Stones”. The birthplace of St Theresa and the burial place of the Grand Inquisitor Torquemada. Avila has kept its medieval austerity. This purity of form can still be seen in the Gothic cathedral and the fortifications which are the most complete in Spain. Charming squares and beautiful quiet pedestrian streets for a very pleasant walk around this old historic town. Consider adding on days to spend more time visiting this historic town. Accommodation on the Gredos rides has been carefully selected, for its quality, character, history, and for its warm welcome to the riders and to the horses. Your accommodation will range from small charming country hotels to luxurious historic hotels, always very comfortable and all with en-suite bathrooms. This may include the luxurious National Paradors (state owned historic hotels) in a hunting lodge built by the king Alfonso 13th, a 4* country estate hotel in a 16th century house with spa and swimming pool, or a small charming six bedroom hotel with an excellent cuisine. At the end of a day in the saddle, you will look forward to arriving at a new hotel, and, wherever that is, you can count on a warm welcome, drinks - of course!, a hot bath, and an excellent dinner. So the next morning, you will be fresh again and ready for a new journey on horseback. This is an inn to inn ride, so every evening you will discover a different charming place. You'll ride your horse right to the entrance of the hotel. At every place, the outfitter has made sure that there are nice fields for the horses to spend the night, and riders will enjoy a view of the horses from the room’s window. In one of the hotels, horses actually come to the window and wake you up in the morning! The cuisine of the region is excellent with top-quality products and much consideration is taken when planning the meals to provide visitors with a sampling of the many different delicious specialties, including wines from Ribera del Duero, produced in the region, and wines from la Rioja. Everyday there is an aperitif stop, mid-morning, which includes some of the following: Iberico ham, chorizo and saucisson, a sample of cheeses produced in the region: fresh and cured goat cheese, manchego cheese, sheep cheese in olive oil... and a variety of olives. You will always be offered a cold young sherry "manzanilla" with the aperitif (other drinks are available too). Picnic lunches are a feast, some cooked on the spot like the barbecues of famous Avilian free-range beef or the Iberian pork; other days, you will have some pre-cooked food in the local bar of the village. Everyday there is a rich variety of salads and tasty tomatoes, and fruit of the season as dessert (strawberries, melon, grapes, and more). For the picnic lunches, tables are laid out and food is served. All the aperitif and lunch spots have been carefully selected for best views and scenery, so while you enjoy the aperitifs and the meals, you will always be surrounded by the horses at rest and beauty. Picnic lunches are always relaxed, very friendly and sociable, as this meal is a very important part of the Spanish culture. Lunches are followed by a “siesta” – of course! Vegetarians and other special diets can be accommodated with early notice. Alcohol is included in all the meals (sherry, beer, white & red wines) Drinks at the hotels before or after dinner are not included. Foodies, history buffs, someone who loves Spain or wants to take a riding vacation in a beautiful, traditional part of Spain. Groups are small with 4-10 members. Single travelers, groups and couples from all walks of life take these rides. They all have in common their love for the horses, the nature and the enthusiasm to enjoy the discovery of foreign traditions. The atmosphere in our rides is very relaxed and very sociable. Riders often make new friends and stay in touch. Maria Elena, the ride organizer, is wonderfully hospitable and has great horses, which is why many riders come back year after year. These horse riding holidays in Spain are geared towards the competent rider and suit those with a reasonable amount of riding experience. On all trips, you will be riding for about five or six hours a day and so a reasonable level of riding fitness will ensure you get the most from your holiday. The Valleys of Gredos is an inn to inn riding vacation. You'll ride horses through a traditional region in the province of Avila, where there is wonderful cuisine, history and culture. It is an excellent terrain for riding, mostly open fields with magnificent views and paths that follow rivers, leading to small villages. A beauitful Spain riding holiday! * Price is subject to change due to currency conversions. Transfers from/to Madrid are included (*); accommodation in comfortable and charming hotels, including the luxurious Paradores; the days riding; excellent leather English GP saddles (small saddle bags and seat savers are provided; all the meals are included: excellent gourmet picnic lunches; aperitifs and tapas; dinners in the hotels; all the drinks are included during the meals (white and red wine, sherry a the aperitifs; beer, soft drinks...) A support vehicle and 1 or 2 helpers – to transport the luggage and prepare the lunches (with set tables, chairs, etc). Limited additional money is needed for the week. Riding and Cooking in Spain. It is not necessary to be an expert rider but it is essential that riders have trail riding experience, can easily manage a horse at all paces and be familiar and comfortable handling a horse on the ground. The pace of the ride will vary, but the ride includes walks, trots, canters and gallops depending on the terrain. A level of fitness is required, as the days are 4-6 hours. Riders can assist in taking care of their horses if they wish - but it is not necessary. Horses will be ready for the riders to get on every morning. Immense landscapes, unspoilt nature, remote Castilian villages, great diversity, delicious aperitifs and picnic lunches, charming hotels … a lot of reasons make this one our most successful riding vacations. One never gets tired of the views, the scents of the wild flowers, and the smiles of the people in the villages. The most spectacular time to ride is in the during the months of May-June, with thousands of wild flowers and the snow in the mountains. The Sierra of Gredos is one of the most characteristic regions of the Iberian Peninsula situated between the provinces of Avila, Cáceres and Salamanca, and crossed by the Duero and Tajo rivers. The landscapes are full of light and colour and natures splendour. The Valleys of Gredos Riding Vacation winds through a very representative part of this region in the province of Avila, truly rural Spain. It is an excellent terrain for riding, mostly open fields with magnificent views and paths that follow the course of rivers. The landscapes are full of light and colour, where wild nature shows its splendour. Riders will be inspired by this Nature Park's diverse display of flora and fauna through the Tormes, Corneja and Alberche river valleys. Ride up slopes of oak, pine and chestnut trees; cross rivers of pristine waters; discover wildlife from rocky overlooks, and gallop across pastures and open fields. The small villages along the trail display their architecture, their traditions, and the way of life of their people, isolated in this inaccessible nature that shapes their unique character. Lodging is planned in some luxurious, with character, and some small and charming country hotels, providing double or twin-bedded rooms and en-suite baths. First, second and last nights are spent at the National Parador of Gredos ***, an ancient hunting lodge built by the king Alfonso 13th, the first Parador opened in Spain. One night is spent at the Hotel Puerta de Gredos (a 4* hotel) built in a grand XVIth century country estate. Other accommodations will be comfortable rural hotels, like La Trocha de Hoyorredondo where the horses sleep in the backyard and come to the windows to wake up the riders in the morning. Single accommodations can be arranged at an additional charge. The accommodation has been carefully chosen for the quality and the welcoming to the riders and to the horses. Every night, the horses stay in a field next to the hotel where the group stays. The contact and the relation with the horses are very special in this ride. Temperatures are strongly influenced by the altitude, with the average of 1400m (the highest point is 1700 m and the lowest is 1000 m ). The Gredos rides will start in April with temperatures that may rise to 15-18ºC. Spring rides are spectacular with “millions” of wild flowers and snow in the mountains (May – Early June).Summer temperatures range from 25-30ºC. Autumn temperatures are around 18ºC during the day. The weather will normally be sunny with clear blue skies with cool nights. The sun can be very intense at this altitude, so a brimmed hat, sunscreen and long-sleeved shirts are highly recommended. Day 2 THE PINEWOODS AND THE SUMMER PASTURES. THE SOURCE OF THE TORMES RIVER. Circle ride from Navarredonda, an easy introductory day, with a picnic lunch in the countryside. Ride through pine woods, open fields and trails, towards the mountains with great views of the Sierra de Gredos. Picnic lunch in the countryside. In the afternoon ride back to the stables in Navarredonda, returning for dinner and overnight as the previous night. This day is a short ride so riders and horses get used to each other. If any change of horse is necessary it can be done, before leaving the next day and for the rest of the ride. A nice small Spa has been open in the next village (5 min away). It is possible to arrange a session - a special rider’s massage - in the evening before dinner. Morning through woods and beautiful meadows in the Tormes river valley. We will follow the course of the Tormes River. Lunch at the Pozo de las Paredes, a magic spot at the gorge of Barbellido, which joins the Tormes River. This spot is ideal for a swim in summer. In the afternoon, riders will follow the cattle path, with great views, to Navalperal the Tormes. This night riders will stay at a new rural hotel: Hotel Rural Cruz del Gallo. A new small hotel, near the Tormes River. Day 4 THE CATTLE PATH TO EL BARCO DE AVILA NAVALPERAL THE TORMES – EL BARCO DE AVILA. Half day ride. Today’s ride proceeds through holm oaks woods and pastures, following the cattle track between Barco and Hoyorredondo, arriving in Puente del Congosto, with a XVth century bridge and castle for lunch. Picnic near the river – a beautiful spot for a swim in the summer. In the afternoon there will be a fun short ride to Hoyorredondo. Night at a beautiful and comfortable rural hotel. A day with great contrasts in the landscape. Today's riding holiday starts in the valley of the Corneja River, open flat valleys until we reach the aperitif stop. We follow the river Corneja to its source, and stop for lunch near one of the water mills along the river. In the afternoon follow a Roman road up to the Puerto de Chia (5,686 feet) for a panoramic view of the Corneja Valley on one side, and the Alberche River on the other. Descend to San Martin de la Vega where the horses will spend the night. Short transfer to a charming rural hotel in Barajas de Gredos. Last day back to the Sierra de Gredos, with some great views of the peaks of the Sierra. Descent towards the Tormes valley where we started. Picnic lunch with panoramic views of the Sierra de Gredos. Short afternoon, with some good canters, back to the stables. Night and farewell dinner at the Parador. After breakfast transfer to Madrid, arriving there about 12 noon. All riders will be transferred at the same time, so if any rider needs to arrive in Madrid prior to noon, all riders will depart earlier - or we will arrange an alternative transfer (at an extra cost). The pace of the ride varies with the terrain. Overall it is a moderate pace, with some slow parts due to the mountainous terrain. There are open areas through the valleys where it is possible to canter with excellent tracks for exciting rides. The average riding time is five to six hours per day. The total distance of the trip is about 110 miles. * Itinerary is subject to changes. The pace of the ride varies with the terrain. Overall it is a moderate pace, with some slow parts due to the mountainous terrain. There are open areas through the valleys where it is possible to canter with excellent tracks for exciting rides. The average riding time from 4 and 1⁄2 to 6 and 1⁄2 hours (one day). Ride horses through a traditional region in the province of Avila, where there is wonderful cuisine, history and culture on an inn to inn ride this summer in Spain. This ride includes a day in Avila, a World Heritage City of Spain. * Price is subject to change based on currency conversions. Transfers from/to Madrid are included (*); accommodation in comfortable and charming hotels, including the luxurious Paradores; the days riding; excellent leather English GP saddles (small saddle bags and seat savers are provided; all the meals are included: excellent gourmet picnic lunches; aperitifs and tapas; dinners in the hotels; all the drinks are included during the meals (white and red wine, sherry a the aperitifs; beer, soft drinks...) A support vehicle and 1 or 2 helpers – to transport the luggage and prepare the lunches (with set tables, chairs, etc). A very limited amount of money is needed for this riding vacation. The summer ride is a real summer holiday, with long picnic lunches and beautiful pools to swim – some are great Jacuzzis! , followed by sunbathing siestas. This is a part of Spain where you can enjoy a great ride in the middle of the summer, with an average temperature in Navarredonda de Gredos, in July-August 25ºC maximum during the day and minimum during the night 12ºC. Five nights are spent at the National Parador of Gredos ***, an ancient hunting lodge built by the king Alfonso 13th, the first Parador opened in Spain. Other accommodations will be comfortable rural hotels. One night at a charming country hotel in the village of Navalperal de Tormes. The last night in Avila is spent at the luxurious Parador of Avila, a 16th century Palace in the historical centre of monumental Ávila, backing onto the majestic city walls. • Option 2: Rural hotel in Navarredonda de Gredos and 2* hotel in Avila. Five nights accommodation in a comfortable and family run hotel in the village. One night at a charming country hotel in the village of Navalperal de Tormes. The last night in Avila will be at a charming hotel in Avila , very well located in the heart of the old town, near the cathedral. Single accommodations can be arranged in any of the options at an additional charge. The accommodation has been carefully chosen for the quality and the welcoming to the riders and to the horses. Every night, the horses stay in a field next to the hotel where the group stays. The contact and the relation with the horses are very special in this ride. A support vehicle will follow the riders during the entire trip, meeting for aperitifs, meals and at night. Vegetarians can be accommodated with advance notice. Meet in Madrid (Pick up at 3pm at the airport) and transfer to Navarredonda de Gredos (2 hour drive), a small village in the heart of Castile with a splendid view of the Sierra de Gredos. This is a region steeped in history, where the Moors and Christians fought, where Romans built roads that have lasted for centuries. Riders will enjoy a welcome dinner and night at the (luxurious National Parador of Gredos) (comfortable country hotel). Circle ride from Navarredonda, an easy introductory day, with a picnic lunch in the countryside, where we will cook an excellent paella. Riding in the woods and towards the source of the Tormes River and alpine pastures of the Sierra de Gredos. In the afternoon ride back to the stables in Navarredonda, returning for dinner and overnight to the Parador of Gredos (or at a hotel rural in the village). Morning along the river to Hoyos del Espino, and climb up to Hoyos del Collado. Riding along an ancient cattle path we will get to Navacepeda de Tormes. Descent towards the Tormes river and the Gorge of Barbellido. Luch at the beautiful Pozo de las Paredes, with a 14th century bride. Ideal for a swim!. Short afternoon with magnificent views to the village of Navalperal de Tormes. Dinner and night at a country hotel in the village. From Navalperal, we will follow the cattle path to Navacepeda de Tormes. Then join the course of the Tormes. Lunch at a fisherman’s hut, at Hoyos del Collado. Ideal river pool for a swim. Afternoon by the river and through the pinewoods to get back to the stables in Navarredonda. Dinner and overnight at the Parador of Gredos (or at a hotel rural in the village). Ride towards the heights of the Sierra de Gredos with magnificent views.. Climb to the Covacha gorge and descent towards the gorge of Barbellido. Lunch by the river, excellent spot for a swim. Afternoon climb to the heights of Siete Fuentes and descent to the pinewoods of Hoyos del Espino. Ride back to the stables in Navarredonda de Gredos. Dinner and overnight at the Parador of Gredos (or at a hotel rural in the village). In the morning climb to the heights of Cañada del Horno, through open fields and dense broom areas, with a great panoramic view of the Alberche river valley. Lunch at a bar in the village . Afternoon with great views of the Sierra de Gredos. Descent back towards Barajas de Gredos and the stables in Navarredonda. Transfer to Ávila (1 hour drive). Day in Avila to visit this historic walled town from the 11th century. Avila is one of the World Heritage Cities of Spain, one of the 660 cultural sites in the world that the World Heritage Committee considers as having outstanding universal value. Recommendations for visits, tours and restaurants in Avila will be provided to the guests. Dinner and night at the chosen hotel in Ávila. The National Parador of Avila. (4* Parador). This Parador is a 16th century Palace in the historical centre of monumental Ávila, backing onto the majestic city walls. Dinner, night and Sunday breakfast at this luxurious Parador are included in the riding vacation. Hotel Las Cancelas 2*, with a great location near the cathedral and a great open air restaurant by the walls. Transfer to the Madrid airport (in time for flights after 1pm). * *This itinerary is subject to changes based on the weather and trip guide's discretion. Avila is a medieval town, surrounded by walls constructed in the 11th and 12th century (2500m, 88 towers, 9 gates) to protect the Spanish territories from the Moors. The walls are still complete nowadays. Avila is the “City of Saints and Stones”. The birthplace of St Theresa and the burial place of the inquisitor Torquemada. Avila has kept its medieval austerity. This purity of form can still be seen in the Gothic cathedral and the fortifications which are the most complete in Spain. Charming squares and beautiful quiet pedestrian streets for a very pleasant walk around this old historic town. This riding vacation is a great introduction to the Gredos and great for travelers short on time. Great views, very diverse landscapes, great changes in the vegetation and the terrain, a varied pace depending on the terrain, about 5 hours in the saddle. Transfers from/to Madrid are included (*); accommodation in comfortable and charming hotels, including the luxurious Paradores; the days riding; excellent leather English GP saddles (small saddle bags and seat savers are provided; all the meals are included: excellent gourmet picnic lunches; aperitifs and tapas; dinners in the hotels; all the drinks are included during the meals (white and red wine, sherry a the aperitifs; beer, soft drinks...) A support vehicle and 1 or 2 helpers – to transport the luggage and prepare the lunches (with set tables, chairs, etc). A very limited amount of additional money is needed for the riding vacation. Three or four nights are spent at the National Parador of Gredos ***, an ancient hunting lodge built by the king Alfonso 13th, the first Parador opened in Spain. Three or four nights in a comfortable and family run hotel in the village, with an excellent cuisine. Single accommodations can be arranged in any of the options at an additional charge. The accommodation has been carefully chosen for the quality and the welcoming to the riders. Breakfast, aperitifs, lunch and dinner are included while on the trek. The local cuisine is excellent and much consideration is taken when planning the meals to provide visitors with a sampling of the many different dishes produced in the area. Lunch is usually a picnic in the countryside with set tables, chairs... and small feast everyday! Some lunches will be cooked on the spot; others prepared the village bars o restaurants, always exquisite. Dinner is at the hotels will feature a varied selection of the typical cuisine. A support vehicle will follow the riders during the day-rides, meeting for aperitifs, meals and at night. Breakfast, aperitifs, lunch and dinner are included while on the trek. Vegetarians can be accommodated with advance notice. Please find below 4 sample day riding holiday itineraries. The 2 to 3 day rides will combine some of these day rides. They are very diverse itineraries, and riding in all different directions from Navarredonda. Meet in Madrid (Pick up at 3pm at the airport) and transfer to Navarredonda de Gredos (2 hour drive), a small village in the heart of Castile with a splendid view of the Sierra de Gredos. This is a region steeped in history, where the Moors and Christians fought, where Romans built roads that have lasted for centuries. Riders will enjoy a welcome dinner and night at the (National Parador of Gredos) (comfortable country hotel). Circle ride from Navarredonda, an easy introductory day. Riding in the woods and towards the source of the Tormes River and the mountains of the Sierra de Gredos. Ride through pine woods, open fields and trails, towards the mountains with great views of the Sierra de Gredos. Picnic lunch in the countryside, near the river. In the afternoon ride through the pine woods to Hoyos del Espino and back to the stables in Navarredonda. Morning through the pine woods following the river Tormes until Hoyos del Espino. Climb up to the village of Hoyos del Collado, where riders will stop for an aperitif. Following an old cattle track, descent towards Navecepeda the Tormes, with a rich vegetation of oaks and poplar trees. Ride through the village of Navacepeda and descent to the river valley. Lunch at the beautiful Poo de la Paredes. This spot with a 14th century bridge ( the access to the high pastures in medieval times), it si an ideal spot for a swim in the summer. Afternoon back to Navarredonda, following the course of the Tormes river, with great views of the valley. Ride towards the heights of the Sierra de Gredos with magnificent views. Climb to the Covacha gorge and descent towards the gorge of Barbellido. Lunch by the river, excellent spot for a swim. Afternoon climb to the heights of Siete Fuentes and descent to the pinewoods of Hoyos del Espino. Ride back to the stables in Navarredonda de Gredos. **This itinerary is subject to changes based on the weather and trip guide's discretion. The Segovia riding vacation is a journey back in time through open landscapes, ancient woods, and river valleys. What makes this Spain riding holiday unique is the exceptional combination of historic sites accessible on horseback with the open and natural Castilian countryside ideal for riding. History at a canter in Spain! * Price is subject to changes because of currency conversions. Transfers from/to Madrid are included (*); accommodation in luxurious, comfortable and charming hotels, including the 4*Hotel Monastery in Segovia San Antonio El Real; the luxurious Parador of La Granja 4*; the days riding with Maria Elena accompanying the rides; excellent leather English GP saddles (small saddle bags and seat savers are provided; all the meals are included: excellent gourmet picnic lunches; aperitifs and tapas; dinners in the hotels; all the drinks are included during the meals (white and red wine, sherry a the aperitifs; beer, soft drinks...) A support vehicle and 1 or 2 helpers – to transport the luggage and prepare the lunches (with set tables, chairs, etc). A very limited amount of money is needed for the week. Not included are special transfers at times other than scheduled times, additional beverages and gratuitites. Drinks at ‘bars’ or hotels outside the meals are extras not included in the cost. Temperatures are strongly influenced by the altitude, with the average of 1000m. The province of Segovia is in Central Spain, in the Meseta, the great high plateau of the Iberian Peninsula. It is situated between the provinces of Madrid, Guadalajara, Soria, Burgos, Valladolid and Avila, in the region of Castilla y Leon. The Segovia ride is a journey back in history, through open landscapes, ancient woods, and river valleys. 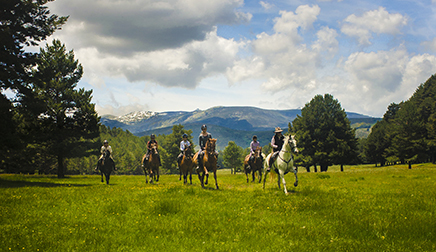 What makes this ride unique is the exceptional combination of historic sites accessible on horseback with the open and unspoilt Castilian countryside ideal for riding. History at a canter! You will explore on horseback some jewels of the Spanish history: the castles of Pedraza and Castilnovo; the romanesque churches of Sotosalbos and Sepulveda; the royal site of La Granja de San Ildefonso, with its grand baroque palace and its beautiful gardens. This ride will take you through very diverse natural landscapes, from the alpine views of the Sierra de Guadarrama, to the old transhumance trails and the open grazing fields; the ancient Valsain forests of pines, oaks, holm oaks and holly bush, where the Spanish kings used to hunt bears and wild boars; and through the vast grain fields, the Eresma river valley and the gorges of the Duraton river nature reserve. The terrain is excellent for riding and the horses are very fit. There are plenty of opportunities for long trots and canters, so this can be quite a sportive ride if the riders wish to go for it! The quality of the accommodation is outstanding, with hotels in great locations and full of character. A 4* hotel built in an ancient convent in the heart of the city, a 4* National Parador in La Granja, a grand medieval castle Castilnovo, and charming and exquisite country hotels in the villages. The ride starts and ends in the medieval city of Segovia, World Heritage Town by the UNESCO, which boasts a magnificent cultural heritage including the colossal Roman Aqueduct from the 1st century AD, one of the greatest in Europe, with 163 arches and 29m at its highest point, and the Alcazar Fortress with its stunning views of the city, among other great attractions. The pace of course will be adapted to the ability of the riders, but in this programme riders can enjoy some exciting rides and the Segovia ride can be quite a sportive week. Maria Elena organizes this ride with some excellent stables from Segovia. This ride will be guided by Enrique, owner and trainer of the horses, an excellent horseman, with a show-jumping and cross-country background. He is passionate about Segovia, the nature and the history of the region. The horses are Andalusian crosses, mainly Anglo-Hispanos (Andalusian & Thoroughbred cross), ranging in height from 15- 16 hh, and selected for their good nature and endurance. They are very well trained for the rides and for school work, dressage and jumping. They are very fit, very willing and they are fun to ride. The tack used is English, general purpose leather saddles with deep knee rolls - no western saddles. Seat savers and saddle bags are provided. Maria Elena will accompany every ride and she guarantees than the standards of this ride are similar to those of her previous rides. The accommodation chosen for this ride is excellent and of special interest in this ride, including some historic sites which are very unique hotels nowadays. Therefore riders will be staying at some luxurious places, with character, and some small and charming country hotels, providing double or twin-bedded rooms and en-suite baths. First and last night will be spent at the Hotel Convento de San Antonio el Real, a luxurious and charming 4* hotel. It was built in the cloisters of an ancient monastery from the 15th century, in the heart of the city of Segovia, a 5 min walk from the Roman Aqueduct. One night will be spent at the National Parador of La Granja 4*, ancient residence of the King’s infants, in a great location near the Royal Palace of La Granja. Another highlight of this ride is one night spent at the castle of Castilnovo (new accommodation for this 2012 ride). This castle is a historic site, a medieval castle, built on some Arab remains, which contains some very interesting collections of armours and a very rich library. Nowadays it hosts a Hispano- Mexican foundation. He rooms are magnificent, with al the modern comfort but with the atmosphere of medieval suites. Other accommodations will be comfortable and charming rural hotels, like the Hotel de la Villa 3* , in Pedraza, built in an ancient noble house; the Posada del Acebo, in Pradena, a typical country style house from 1752; or the Posada Molino del ̈Rio Viejo, an ancient water mill converted into a charming small hotel. Single accommodations can be arranged at an additional charge. Breakfast, aperitifs, lunches and dinners are included while on the trek. The local cuisine is excellent and much consideration is taken when planning the meals to provide visitors with a sampling of the many different dishes produced in the area. Lunches are exquisite picnics in the countryside with set tables, chairs... a small feast everyday! Dinners at the hotels will feature a varied selection of the typical cuisine. Transfer from Madrid (pick up at 3pm) to Segovia, about 1 and a half hour drive. Accommodation at the Hotel San Antonio El Real (4*), a luxurious and charming hotel. It was built in the cloisters of an ancient monastery from the 15th century, in the heart of the city of Segovia, a 5 min walk from the Roman Aqueduct. Transfer to the Equestrian Centre to see the stables and the horses. After meeting the horses, panoramic visit of the city of Segovia by car and a welcome drink in the Segovia main square. Welcome dinner and night at the hotel Sna Antonio el Real, which has an exquisite cuisine. Morning ride from Segovia to the forest of Valsaín. We will follow transhumance trails, such as Cordel de Santillana and the Cañada Real Soriana to get to the source of water to of the Roman aqueduct, following the reservoir waters and the Acebeda stream. Then following the Eresma river valleys, we will get to the forest of Valsaín for a picnic lunch. These forests were traditionally hunting reserves for the kinds of Castile and nowadays they are protected nature parks. In the afternoon ride to La Granja de San Ildefonso, where we will stay at the luxurious National Parador of La Granja 4*). Visit of the baroque palace and the gardens of this royal site, built in the times of Felipe V. Dinner and night at the Parador. From La Granja we will rejoin the Cañada Real , at the Caserio de Gamones. We will ride on the slopes of the Sierra de Guadarrama, until we get to Sotosalbos. Aperitivo stop and visit of the Romanesque church from the 13th century. Riding through countryside of holm oaks, through the small village of Requijada, we will get to our picnic stop, near the river Cega. In the afternoon, we will ride by the Ermita de Las Vegas, and follow the Cega river to Pedraza. This is a beautiful medieval village, with an imposing castle, charming cobbled streets and a charming main square. Dinner and night in the Hotel de la Villa, a 3* hotel in the heart of the village. From Pedraza, and we will follow ancient bridle paths. Through nearly abandoned rural villages, with a typical architecture in stone and timber. We’ll stop for an aperitivo in the country. Riding through open farming land, we will reach the plains where stands the fortress of the Castle of Castilnovo, where we will finish today’s ride and have lunch. In the afternoon visit of the Castle and drive to the Duraton river gorges and the jewel Ermita de San Frutos. Dinner and night at the grand castle of Castilnovo, which has restored 10 bedrooms with all the comfort, and the atmosphere of medieval times. This day we follow the Duraron river, riding in the valley and the hill of los Cortos. We will stop for an aperitivo at the Duraton villlage. We will ascent towards the Sierra to rejoin the Cañada Real (wide and open transhumance trail). Picnic lunch near Enebralejo. In the afternoon we will pass Enebralejo, where we can stop to visit the prehistoric caves. Ride on to Pradena a typical mountain village. Dinner and night at the Posada del Acebo (“The Holly bush Inn”, typical house from the 18th century. We will ride in the slopes of the Sierra de Guadarrama, in the Cañada Real, and thourhg the oak forest of Pradena. Aperitif stop in the Cañada, which we will follow until we get to Navafría, a mountain village with a timber production tradition. Picnic lunch by the river Cega. Morning ride passing through Santo Domingo de Pirón and Torrecaballeros. Early picnic lunch at the well preserved remains of an old ranch, where shepherds use to stop with their flocks to sheer the sheep, during the long transhumant journeys. Short afternoon back to the stables in Segovia. Transfer to the hotel in Segovia. Afternoon free in Segovia. Dinner and night at a restaurant in Segovia. Night at the Hotel San Antonio el Real 4*. Morning ride passing through Santo Domingo de Pirón and Torrecaballeros. Early picnic lunch at the well preserved remains of an old ranch, where shepherds use to stop with their flocks to sheer the sheep, during the long transhumant journeys. Short afternoon back to the stables in Segovia. Transfer to the hotel in Segovia. Afternoon free in Segovia. Dinner and night at the Hotel San Antonio el Real 4*. After breakfast transfer to the Madrid airport, arriving there about 12 noon. All riders will be transferred at the same time. Transfer can be arranged at a different time is that is more convenient for the group. * Itinerary is subject to changes. The pace of the ride varies with the terrain. Overall this can be quite an sportive ride, with long trots and canters, and even some small cross-country jumps if the riders want to go for it. The pace will be adapted to the riders’ abilities and desire. The average riding time is five to six hours per day. The total distance of the trip is about 115 miles. Towers, Romanesque churches, squares, steps, mansions and Renaissance palaces, synagogues, porticoes, convents, gardens... Segovia boasts a whole host of monuments and an almost endless list of places of interest. You will see one monument that predominates over everything else: the spectacular Roman Aqueduct, an engineering achievement dating back almost 2,000 years and whose colossal appearance is still intact today. The best view of it can be obtained from the popular Plaza Azoguejo square: the huge blocks of granite stand 29 metres tall, seeming to dwarf everything in the vicinity. A stroll through the streets of Segovia is a pleasant and very interesting way of gaining an insight into the history of Spain. Over the centuries, various civilisations (Romans, Arabs, Jews and Christians) have left an artistic heritage that is difficult to match elsewhere. This will become obvious as you stroll through its old town, whose streets still boast the medieval structure and civic and religious buildings of various architectural styles. Many of them were built during the Middle Ages, the heyday of this city. One example from this period is the Cathedral, the last Gothic building constructed in Spain; another is the Alcázar, the impressive fortress with its stunning views of the city. And then there is the unique Casa de los Picos House, the Alhóndiga corn exchange market, with a façade that leaves no-one unmoved, and the tower Torreon de los Lozoya, originally a 14th century defensive structure, which are now used to hold cultural exhibitions. I can't thank you enough for a wonderful, wonderful riding vacation. It was the best ride we have been on. Your thoughtful attention to every detail made the difference. It is always a determining factor with us when the horses are so well cared for, and cared about. I loved riding Ur. He is such a character, and his wonderful, comfortable canter, made all the long canters so much fun, especially for someone who NEVER rides like that! I wish he was ready for retirement -- I have just the place for him!! It was delightful meeting you. Thanks, again. This is just to say thank you so much for a brilliant week. The horses were magnificent. All your organisation: of the routes, the accommodation, the lunches, the aperitifos and the swims was outstanding. Above all you and your team were charming, caring and most hospitable. We couldn't have enjoyed our time with you more, and are already working out how soon we can come back for more. I can see just how much work you all put into arranging the trips - the result is a great success. We had the best possible time in the Gredos mountains and you were absolutely brilliant. Peter and I are now hooked on riding holidays! I have hardly ever been on such a beautifully organized holiday, everything worked absolutely seamlessly, but I know that when something seems so effortless there is a fantastic lot of work going on behind the scenes! You really do run a remarkable outfit. Hopefully one day we will be back. That was the most wonderful ride. How we all enjoyed it!!!!!!! You took care of every little detail so we didn't worry about a thing. The horses were well trained and very capable of doing their job safely and efficiently. Their tack was in excellent condition. Everything about your stable showed how much you care about the riders and the horses. Meals were fantastic. You made it fun, we appreciated all your cooking and generosity with food and wine. It was such a good time plus we got in lots of riding over different kinds of terrain, through quaint villages, along picturesque streams and rivers, through pastures and forests. I loved riding in sight of so many mares and foals. What beautiful horses they all were! I could go on and on about how wonderful it all was and have been regaling family and friends with stories ever since I came home. We had such a good time, we are planning on coming again in a couple of years and will try to bring more with us. Thank you so very much for the experience of a lifetime. We can't thank you enough for everything you did to give us such a wonderful time on the ride last week. We both enjoyed every minute,& seeing all that beautiful Spanish countryside & even getting wet!! & you couldn't have looked after us all better. We loved our horses, & you were SO clever at fitting the rider to the horse!! Nothing was too much trouble for you & we are most grateful for all you did for us, would you please pass on our thanks to your girls. We are recommending your ride to all our friends! Just want you to know that we had a really fabulous trip. You outdid yourself. We loved the country, the fit horses who were so well taken care of, the wonderful meals, our small rural hotel and its cuisine, Avila and of course your great personality. It all worked well, even after my rocky start. We are talking it up and hope we can get you some customers. Take care. Thank you for the most wonderful riding holiday! I enjoyed every minute of it and am missing George already! We were so lucky with the weather and having such a good group and the countryside was so beautiful. Again many thanks for a really amazing time. Many thanks again to you and your girls for a really relaxing and beautiful holiday. We really appreciated the attention to detail that made our holiday flow so well and it really met our every wish for our perfect horsey holiday. I just wanted to thank you for the most wonderful holiday ever. Published in 1940, it tells the story of Robert Jordan, a young American in the International Brigades attached to a republican guerilla unit during the Spanish Civil War. As an expert in the use of explosives, he is assigned to blow up a bridge during an attack on the city of Segovia. They escape to the Gredos seeking for refuge. All riding vacations are for Intermediate to Advanced Riders. Children with parents or responsible adult on the summer rides. Age : Depends on ability, minimum 14. Sierra de Gredos summer ride. Average 5 hours. Trails of Andalucia. 4-6 hours. Segovia: History at a Canter. 4-6 hours. Minorca, the Balearic Islands. 4-6 hours. Madrid. Transfer from/to the airport included.